Save 10% all year on your chrome shop purchases! Join the hundreds of customers who are taking advantage of our NEW ETC Elite Card program. The membership card costs $95.00 and gives you 10% off all regularly priced items for an entire year. That’s 365 days of savings for one small fee. The membership pays for itself very quickly. Spend your first $1,000 and the card pays for itself and you’ll already save $5! 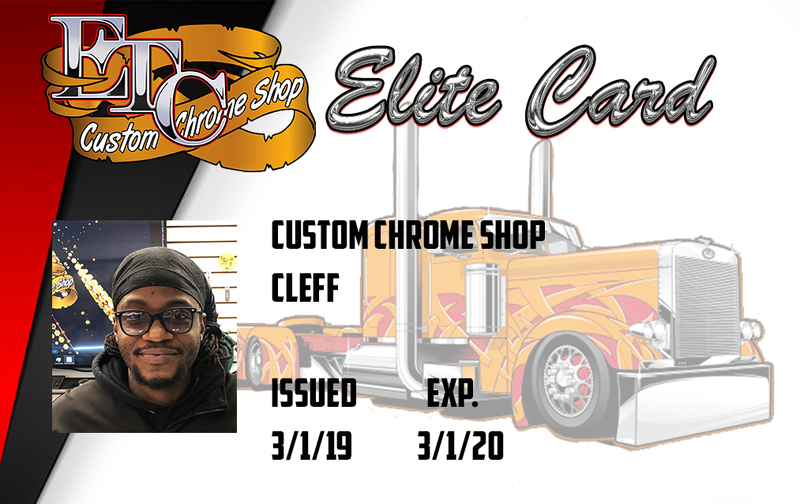 Speak with your favorite ETC Chrome Store representative for more details or contact Gena to learn more at 908-355-8800 ext.16 [email protected]. *discount does not include shipping, sales tax, sale items, specials or other already discounted items. Elite card must be present to receive the discount.